2 513 graduates were capped at the National University of Science and Technology (NUST) at a ceremony held at the institution's campus in Bulawayo today. 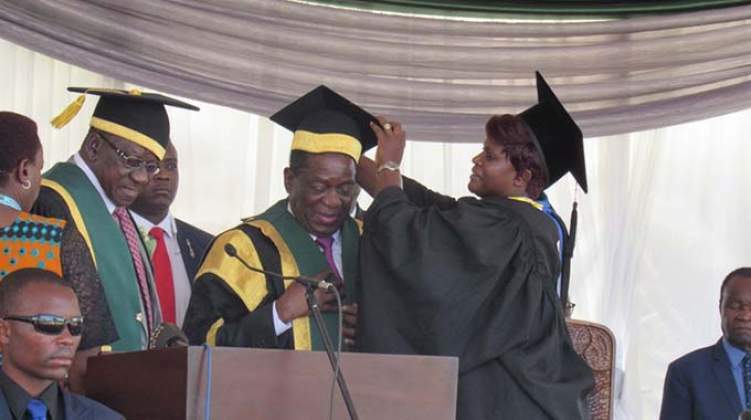 At the graduation ceremony, President Emmerson Mnangagwa was also installed as the university's chancellor. After toiling for years to attain higher education qualifications, it was jubilation time as friends and relatives came to cheer their beloved ones being capped with degrees in their various fields of study at NUST. Professor Engineer Mqhele Enock Hershal Dlodlo who was installed on the day as the university's third vice chancellor said no economy grows without the full exploitation of its natural resources adding NUST has research models tailor made to support local industry. "Under the new government's thrust there is a need for us as a technology center to help in developing local products for higher export value and aggressively market our innovations and stop the current trends of exporting raw materials," he said. President Mnangagwa who was also installed as the Chancellor for the country's technology nerve centre NUST said the university has a clear mandate to spearhead the development of human capital for industrial and socio-economic transformation of the country. "NUST must rise to the demands of its mandate and statutory obligation and help industrialise and modernise all sectors of the economy," said the President. NUST is the country's technological innovation hub and according to President Mnangagwa the adoption of the latest technologies will help the country to leap-frog other nations and attain the upper middle income economy by 2030.